I’d not heard of The Rising prior to seeing their name attached to the forthcoming Jess and the Bandits tour; but their record company sent this CD anyway. While I’ve been inundated with albums lately; I still found time to play this; although out of courtesy more than anything else. Most Americana bands I review; and in fairness most bands I like, are quite quite edgy and often a bit miserable in their lyrics and style of playing. The Rising are at the other end of that spectrum and proved a great companion for yet another long motorway journey. Opening with anthemic Calling You; the trio quickly had me nodding my head to the infectious beat ; and the rakishly handsome Tristan Harris’ voice will have ladies of all ages going weak at the knees. City By the Sea shares a title with my favourite song by Sunderland collective The Lake Poets; but apart from Belfast and Sunderland being ‘cities by the sea’ they couldn’t be more different. This song is very radio friendly; with a strong message about coming from and leaving their home city. Now I think about it, it could be a companion piece for Energy Orchard’s Belfast which I fell in love with 20 years ago. 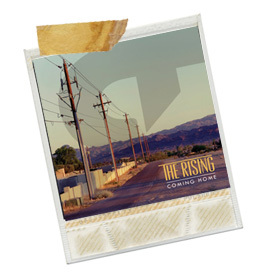 The Rising were apparently originally a four piece Rock Band; and repeated listening makes that obvious; as their take on Country Rock has a powerful swagger to it; rather than most bands easy-listening Laurel Canyon vibe. For relatively young lads they have a really ‘tight feel’ to their playing; alongside Harris’ cracking voice, Chris Logan plays a pretty mean guitar (banjo, mandalin and piano too) while bass player Andy Morgan orchestrates the whole show alongside a Shane Walters on the drums. Probably aimed at a younger demographic than the one I inhabit The Rising can really write a quality modern Country song and deliver it with panache and restrained power. Highway to the Lost and Found is a great example, as is the Bon Joviesque Label Girl. The finale is a bit of an epic tale, coming in at nearly 7 minutes long, but Return to the Moon (song for the Human Race) is worth the investment and I’m sure will be a real pot-boiler when played live. Normally I’m championing singer-songwriters from this much maligned part of the UK but Northern Ireland has done it again with a band that are destined for a stadium near you very soon.